If you’re in the “not so much” crowd and you prefer to miss God when you make a decision, I thought I’d offer a few pointers today–from my own personal experience–about how you can get better at missing God. 1. Have a pre-determined outcome in mind, and look for Scripture to support your outcome. I did this once with a real estate deal. It was at the beginning of the real estate and stock market crash in 2007-2008. The deal wasn’t working, and it was a bad idea anyway. However, I found a Scripture that I (mis)interpreted to say that the deal WOULD work if we stuck with it long enough. But it didn’t. And now… I’m so glad! But I was so sure I had heard God. It turns out that I just had an idea of the pre-determined outcome I wanted, so I found Scriptures to match what I wanted, without actually listening to God. If you want to totally miss God, decide which way you want your decision to go before you ask God for His advice. Then just find some verses that match that outcome, even if they’re taken out of context. It’s a guaranteed way to miss God every time. 2. Make your decision when you’re as empty of the fruit of the Spirit as possible. It would be ideal if you could make all your biggest decisions when you’re as mad as possible, as depressed as possible, or as offended as possible. After all, anything that’s birthed without the fruit of the Spirit is sure not to result in the work of the Holy Spirit. Anger breeds more anger. Offense breeds more offense. Hopelessness breeds more hopelessness. Therefore, making decisions when you’re not in the frame of mind to be effective will definitely help you miss God. 3. Avoid getting wise counsel at all costs. Other people’s wisdom is really unnecessary. You have all the wisdom and experience you need; you are the consummate expert on everything. What’s up with that verse that says “Where there is no counsel, the people fall; but in the multitude of counselors there is safety” (Proverbs 11:14)? Get all your financial advice from really broke people. Get your career advice from someone who was just fired from their job for cause. Get your best parenting advice from people who have no children. Avoiding wise counsel will help you really excel at missing God. 4. Don’t compare your decision to the Word of God, the Bible. Therefore, if you want to miss God, don’t look for His advice in the Word. If you do slip and check out the Word, don’t obey what you read there. 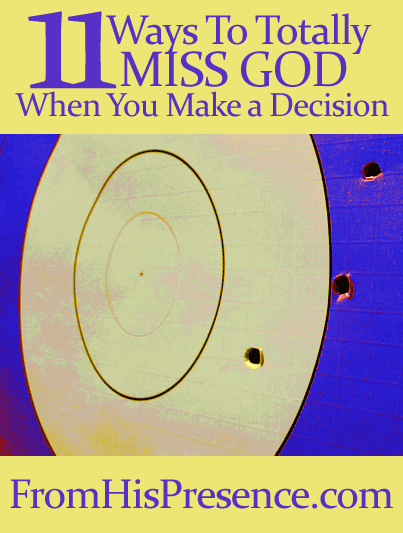 That is a surefire, 100%-of-the-time tested and proven way to miss God’s will when you make a decision. 5. Do whatever your spouse thinks you shouldn’t do. Women, your husband is a covering for you; and men, and your wife is a support and helper for you. God gave him or her that position. So if you want to increase your chances of missing God when you make a decision, don’t take what your spouse says into consideration. 6. Do whatever your godly authority figures think you shouldn’t do. All authority comes from God (Romans 13:1). So your leaders were placed over you because you need them. If you want to miss God when you make your decision, don’t listen to your leaders. Even better, as in point #5, you might even want to do the opposite of what your leaders say you should do. They probably don’t have any perspective or experience you don’t have, so their advice is really unnecessary if you want to miss God. 7. Do the opposite of what you have peace about. those are great indicators that you’re missing God. If you wanted to hear God, you’d let peace be your umpire. You’d do what you have peace and the fruit of the Spirit about. But if you want to miss God, you should totally ignore those things. Works every time. 8. Make every decision as fast as you can. Do not, under any circumstances, slow down and take your time if you want to miss God. I repeat: do NOT slow down for ANY REASON! You should buy that pretty car that caught your eye, whether you can afford the payment or not. You should make lots of commitments to other people–as soon as they ask–despite what your family needs. Just be decisive. That’s the most important thing if you want to miss God. 9. Pay no attention to common sense, since God will come through with a miracle to back up your decision. God is the God of miracles. If you want to miss His best for your life, you should assume that He will always come through with a miracle to back up whatever you do. After all, He exists at your whim, right? 10. Do whatever other people tell you to do, without fail. …if you want to miss God. You should always adhere to what your in-laws think you should do for your family. You should always volunteer at churches and charity organizations every time there’s an opportunity. Yep. Definitely do what other people tell you to do at all times if you want to miss God when you make a decision. Your whole life should revolve around making other people happy, right? 11. No matter what you do, don’t pray about it. Prayer is absolutely one of the two top ways to hear God–with the Bible being #1 (see point 4). If you want to miss God, DO NOT PRAY. No matter what. Missing God is easy. Anybody can do it. In fact, you can be excellent at missing God; you don’t even have to try very hard. Just do the 11 things above, and you’ll be an expert at missing God’s will in no time. What are some other ways you can think of to miss God when you make a decision? Please share in the comments below! Image courtesy of Mixy Lorenzo on Flickr. This post is linked up at Titus2Tuesday on Cornerstone Confessions. 12. Be confident that God no longer speaks to people in this day and age. . . . . until you discover God can overcome any barrier you set up to keep Him out! I was clicking through Pinterest and saw your post regarding A.W. Tozer’s book. After reading your review, I decided to order it. Before I left your blog I saw this article and read through it. Talk about the Holy Spirit moving at just the right time!!! I had just got off the phone from a disagreement with my boyfriend (I hate that word, being 57 and all!) about coming to see him this Sunday (he’s in Houston for work and I live outside of San Antonio), even though I had already committed to an Easter lunch with my sister and her in-laws. After much “wailing and gnashing of teeth” I told him that I would come as soon as I could AFTER the lunch. You guessed it, a deluxe all-inclusive guilt-trip was arranged, at no charge, courtesy of his recriminations about how he’s not at the top of my priority list. Numbers 7 and 10 JUMPED out at me as I realized that my commitment to my only sister, made 3 weeks ago, was more important than giving in to whiny “boyfriend”. Here’s “the rest of the story”: he called back to tell me to wait until the next weekend to visit because he doesn’t want to be “kept hanging” about what time I’ll be in Houston. Talk about a revelation…not a good one, but still a revelation about his character, which obviously I needed to see. 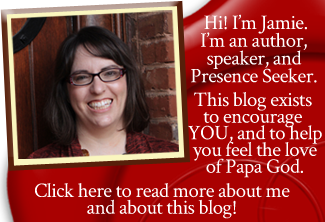 Thank you for your insightful, Bible-based blog, and thank you for letting me vent! Wow, Cathleen! That sounds so frustrating, but I’m so glad Papa helped you in this situation. And you will LOVE the Tozer book. His stuff is so powerful… it just makes me cry as I read because the Holy Spirit sits down on me so powerfully. He was a man who knew God, and you can tell from the way God uses him to share truth. Blessings to you! Man I think I’ve done most of these goodness. That’s why my Christian walk is weak and ineffective. I want a strong Christian life I need guidance. 1 spend more time worrying about missing God. 2 spend more time thinking about what people might do next to confuse you. 3 exhaust yourself with strategies to combat confusion and fake threats that you have created in your own fear based mind. That should help in some other ways to miss God.